Posted April 8, 2014; 1:45 p.m.
Sustainability means to provide a way to address ecological, social, and economic concerns, by creating ways that they can all work in harmony. A lot of local colleges in the area, including University of Missouri-St. Louis, Saint Louis University, Washington University, St. Charles Community College and Maryville are members of Association for the Advancement of Sustainability in Higher Education. AASHE offers awards to colleges who promote and provide sustainable practices on their campus. President James Evans for Lindenwood University said that while there are no immediate plans to create a sustainability center on campus, they are working with the LSGA and LU Sustainability Alliance to reduce the campus’ carbon foot print. “We are working with both the LSGA and the LU Sustainability Alliance to review our present recycling program, with an eye towards expanding it somewhat,” said President Evans. 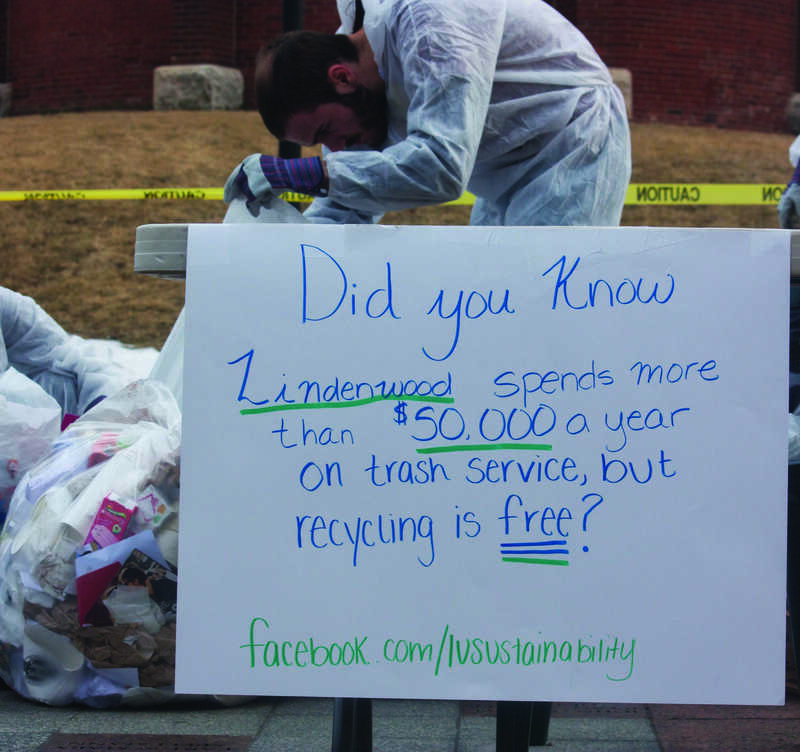 Recycling is a major concern for the LU Sustainability Alliance; they recently hosted a “Dumpster Dive” event to see just how much of the waste that Lindenwood generates could have been recycled or composted. They collected data that will be used to apply for grant funding that will hopefully bring a comprehensive recycling program to the university. Kothe said the dumpster dive project indicated that 78 percent of the waste Lindenwood generates and sends to the landfills could have been recycled or composted. This finding corresponds very well to the numbers Scott Roberts, CEO of Always Green Recycling, gave last year in an interview where he said he estimated 75 percent of potentially recyclable material generated by Lindenwood is still going to the landfill. The LU Sustainability Alliance is looking to change these numbers by hopefully started in the near future a dorm recycling program. “We are excited for the upcoming start of a dorm recycling pilot program in Blanton Hall. This program will hopefully lead to recycling opportunities in dorms campus-wide,” Kothe said. Getting students in the habit of sustainable practice is the problem both the LU Sustainability Alliance and Maryville University run into when trying to fulfill campus-wide initiatives. Lauer said, “Our biggest issue to tackle is changing behavior.” However, she said it was the students that created the recycling program on Maryville’s campus. President Evans said Lindenwood has made many changes to campus life that promotes sustainable practice, including; energy reducing features on the new construction projects and expanding campus technology. “We have also spent considerable money on the expansion and updating of campus technology to, among other things, encourage paperless communication, and paperless quizzes, tests and class projects,” President Evans said.